This week was relatively normal, but somehow I only have 3 warm-ups to share.Enjoy! Please comment when you’re finished reading and let us know what you think! Yep, we’re still working on subtraction around here. It’s kind of an all-the-time thing because as soon as you abandon it for longer than a few days everyone forgets how to do it! This time I gave them the answer and the strategy and had them analyze it for me. We had a great conversation about why this problem was most efficiently solved by making an easier problem (rather than say, the traditional algorithm or splitting and using a number line to model it) because the second number was close to a hundred. This made it SUPER easy to subtract in just two easy steps. We are also still working on multiplication, including writing an equation and drawing a model. This one was cool, because as often happens, kiddos thought of a model that I hadn’t: showing the repeated addition on a number line. This was a great conversation about which number meant what in the problem (the number of groups vs. the number in the group), and we also talked about how you could flip the problem around and have the same answer. There’s not a lot to explain behind this one except that I wanted to continue to focus on the idea of a fraction being EQUAL pieces, not just the number of pieces in the denominator. As you can see in many of the post-its, most kiddos understand this when they partition the cookie cake for 4 people. As I mentioned with a problem or two last week, kiddos are to have a basic foundation of groups and arrays to help them with further multiplication concepts in 3rd grade. We played a game called Circles and Stars last week, which is basically where they roll a dice twice, once drawing circles and then filling each with the 2nd number’s worth of stars. Then they figure out an equation to go with the model as well as how many stars there are altogether. I wanted to build on this idea and see what they’d do with a new problem. As is seen on their answers, they almost all drew circles with stars (or dots). I wanted to help them see the same idea as an array, as well, so I connected the equation to brownies (so they pan/array would make more sense). Somewhere I had saved a picture of my original problem which looked like this (the purple writing on the chart): If I had a pan of brownies that had 7 brownies on one side and 5 brownies on the other, how many would I have? When I looked at the answers, I was completely baffled as to why so many had answered 6X2=12. We had a great decision about how they used 7+5=12 and then made a multiplication equation that matched. There were also some pretty interesting models/pictures of the equation, too, so I drew an array to show what I meant. Once they saw it, they could see what I meant, but we agreed that the problem I had written didn’t lead them to that understanding. I asked them to help me figure out how I could have better written the problem so that they could have seen what I meant. We worked to revise the question so it made more sense. This was a GREAT conversation both about math and revision, which is something Rm. 202 friends know happens ALL THE TIME, not just in writing. They did a super job of helping me redesign the warm-up so that it better matched what I wanted to know. Now it reads: If I had a rectangular pan of brownies that had 7 columns of brownies on the long side of the pan, and 5 rows of brownies on the other, how many would I have in the whole pan? Draw a picture. Great work on the writing and the math, Rm. 202 friends! It seems like addition and subtraction is a never-ending concept with 2nd graders, and we’re still working on it. Oh well, as long as it takes. School year’s not over yet and they can get it! Here was another opportunity to practice. Another topic (which I found a way to weave into this conversation, too!) is the foundation of multiplication. We told many stories of groups of things with this one. Great thinking, Rm. 202 kiddos! We have been working on subtraction lately, and my kiddos have started to do some amazing thinking with negative numbers as a means of figuring out differences. It started with just a couple of friends a couple of weeks ago and now probably at least half the class has tried it! The chart here is similar to the HTO model (which we called Sticks and Dots back then) we used in 1st grade, but connected to an investigation we did with the T-Shirt Factory and refers to the inventory of t-shirts. The come in Boxes of 100, Rolls of 10 and then loose ones. Same idea, but inside the context it makes much more sense. Like most times, you’ll see we did it using two other strategies, as well. The green numbers on top are from the strategy Making an Easier Problem, in this case by adding 11 to both numbers (which we know is possible because of the idea of constant difference). We also tried it with Circle, Split, Subtract and modeled our thinking on a number line. And check it out–we got 289 every time! …as well as with our negative number strategy. Again, we got the same answer both times! On Tuesday during math, I gave kiddos a check-in sheet to see what they could do on their own with subtraction, now that we’ve been working on it for a while together, and the last problem was a challenge problem. Ok, it really isn’t that much harder (just another place), but I wanted to see what kiddos would do when I added 1000s to our work. Landen and Ava decided to that the BRL chart would probably work the same way if you just added another column, and suggested that we try it together as a math warm-up the next day. Great idea, kiddos! Somehow I took my picture before we had done our work on the chart, so you can’t see it, but believe me–it worked just like they thought it would. Oh, and when I was using this chart again with someone later that day, we decided that instead of just T for thousands (which doesn’t fit the context of the t-shirt story), we’d say T was Trucks, because you could put 10 boxes on trucks. They were able to figure out the meaning (for the most part), although many kept saying it meant “straight” and we had to clarify what they really meant, because ALL of those lines are straight….and while I don’t like math tricks, I did show them that in the word PARALLEL are clues to what it means: PARA for the PAIR of lines, and that the l’s make two parallel lines themselves (ok, well they do if they’re lowercase…see, told I don’t like tricks). Today’s MWU was geometry again, related to work we’d done this week, as well as connecting to the work I knew I’d have them do during Math Workshop today. Win/win! (Oh, and I realize now I mislabeled the trapezoid as a parallelogram. Oops. I’ll fix that on Monday. 🙂 ). Note: See that “next” on the bottom? I’d tried many versions of that extra question this week on math and writing warm-ups. It seems that when I put “bonus” there, kiddos thought that meant they didn’t have to do it. LOL So I tried “next” and also “big ?” to help them see that they could do both of them. Or at least start thinking about the answer, since it would be what we’d be talking about anyway. I had thoughts all last week of how I couldn’t wait until the Warm-Ups post to brag on the awesomeness that happened, but alas, I guess I saved it anyway….so get ready, this is definitely NOT first grade math happening here, people! We had three problems this week, and they were all in the same vein–2-digit subtraction where kiddos were asked to try ALL 4 STRATEGIES we’ve worked on in our class this year. And they were up to the challenge, even though it had been a while since we’d worked on subtraction. I was SUPER impressed, and I think they were, too! 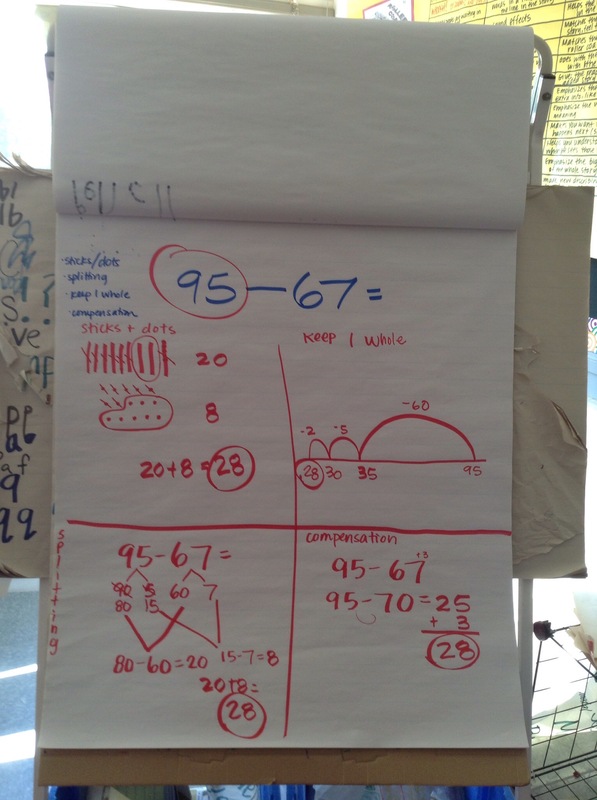 My favorite part is when we started with sticks and dots, and we realized that we couldn’t do what the numbers told us to do–we couldn’t take 7 dots away from the 5 we had drawn. Millie noticed it right away and then we had a great conversation about what we could do about that. Makayla suggested that actually there were 10 dots inside each of the sticks we drew (how’s that place value work for ya?). We decided if we crossed off that last stick (which represents a 10) and added those 10 dots instead to the dots already there, then we could do it. We ended up with 15 dots (ones) that we could take 7 away from. We used the double-minus-1 problem of 14-7 is 7 so 15-7 is 8 to get that part of our answer.